June Aochi Berk, Rusty Frank and Takayo Tsubouchi Fischer. SANTA MONICA — “Barbed Wire to Boogie Woogie: Swing in the Japanese American Internment Camps” will be presented on Saturday, May 19, at 2 p.m. in the Martin Luther King Jr. Auditorium of Santa Monica Main Library, 601 Santa Monica Blvd. in Santa Monica. Now in its 16th year, Santa Monica Public Library’s Santa Monica Reads is a community reading initiative that encourages all residents and visitors to read and discuss the same title in book discussions and special events held throughout the city. This year’s selection is “Farewell to Manzanar,” the classic memoir by Jeanne Wakatsuki Houston and James D. Houston, which chronicles young Jeanne’s experience with her family in the World War II-era Japanese American internment camps. Dance preservationist Rusty Frank presents the uniquely American art form of swing dance through oral history and archival clips, and discusses how it gave young people respite from their lives in the camps. Even if they did not have radios, some people had old phonograph records and the young Nisei danced to the swing music of Glenn Miller, Tommy Dorsey, Benny Goodman, and Duke Ellington. 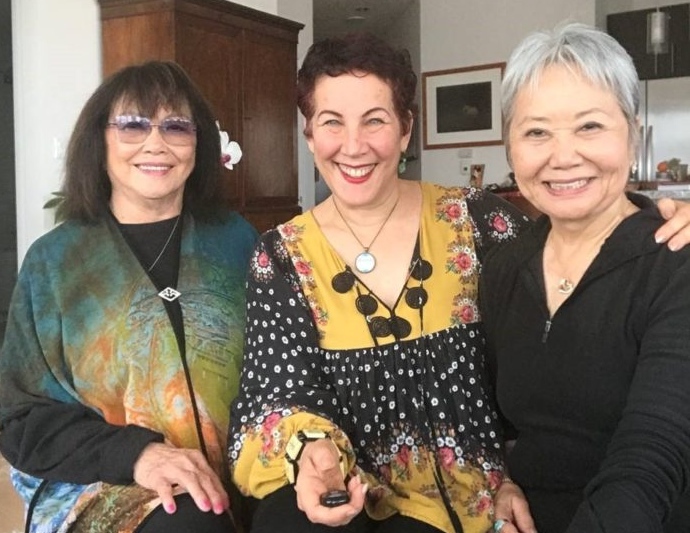 Takayo Tsubouchi Fischer and June Aochi Berk, who met while incarcerated at the Rohwer Relocation Center in Arkansas at the age of 10, will share photos, dance cards and other memorabilia. After the presentation, Frank and program attendees will adjourn to the North Courtyard for an easy dance lesson on the “Shim Sham Shimmy.” No partner is needed. Anyone who remembers dancing in the camps is welcome to join the conversation. And if their children want to learn more about how their parents coped in the camp, they are also welcome. Frank is a tap dancer and Lindy Hopper, producer, choreographer, author and dance preservationist. She founded the longest-running Lindy Hop swing dance program in Los Angeles, the Lindy by the Sea dance school in El Segundo. Her Rhythm Club weekly swing dance in Playa Del Rey is one of the few clubs in the nation featuring an evening of dancing to live bands. Learn more at http://rustyfrank.com. This program is free and open to all ages. Seating is limited and on a first-arrival basis. The Santa Monica Public Library is wheelchair-accessible. The Main Library is directly served by Big Blue Bus Lines 1, R10 and 18. The Expo Line and Big Blue Bus lines 2, 3, R3 and 9 stop nearby. Ride your bike. Bicycle parking racks are available at the library. For more information, visit www.smpl.org.